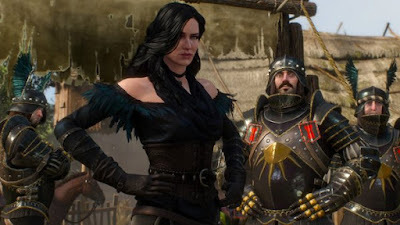 - Next you need to choose some clothes for Geralt. Choose whatever set you fancy most and put it on. Before speaking to the Chamberlain, have a quick look around and you can loot a variety of containers for some minor stuff. There are lots of books to loot. - Next: bowing. Oh lord. Choose the second option to appease the guy, then follow him out of the room. He’ll lead you to the Emperor. You may or may not bow; not bowing is funnier. - Once the audience is done you’ll wander through the castle apace. There’s stuff to be found if you want to search through containers, particularly in the room that is your destination. Stick with the Chamberlain, and, ultimately, he’ll lead you to Yennefer. A lengthy, kind of awkward conversation follows. - One last thing before you take off. There’s a Nobleman sitting in the garden courtyard nearby. He’s one of the Gwent players you need to defeat for the Collect ‘Em All quest. Take him on, beat him - or lose to him, your call - then use the Fast Travel point at the castle entrance to head to your next destination, the Hanged Man’s Tree in Velen.